If you wish to apply for a Federal Work Study position in Handshake, watch the step-by-step video or follow the instructions below. From the homepage, start by clicking on Jobs in the top menu bar as show below. You will be taken to the JobSearch page. 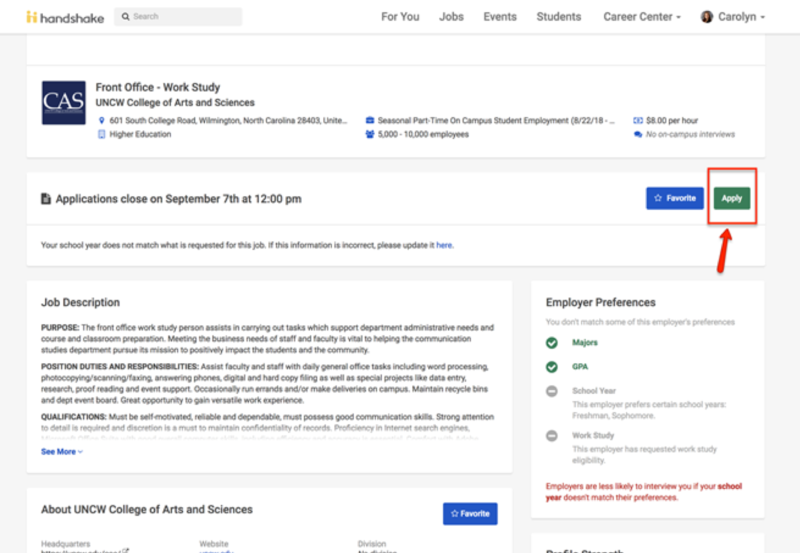 To search for Work Study jobs, type the key words “work study”in the search bar and hit 'enter' to launch your search. From here, you can continue to narrow your search by adding additional filters by clicking the blue “Filters” button. 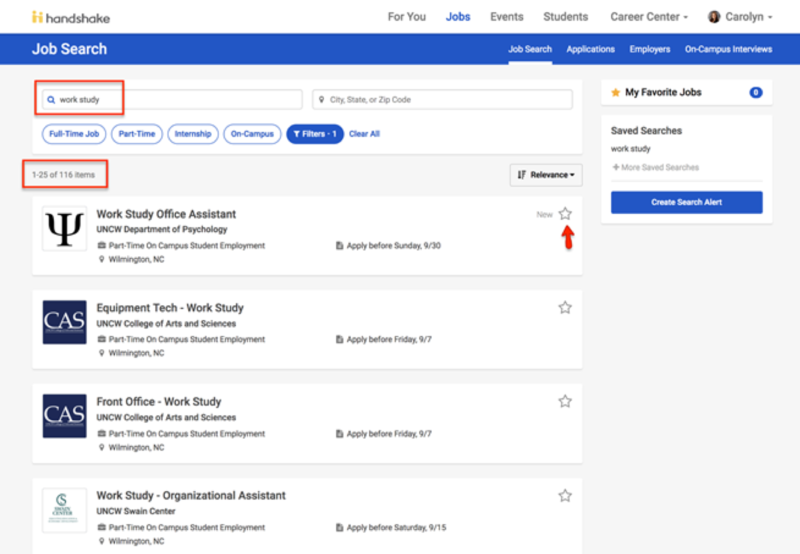 Some common filters include on-campus & paid roles only. 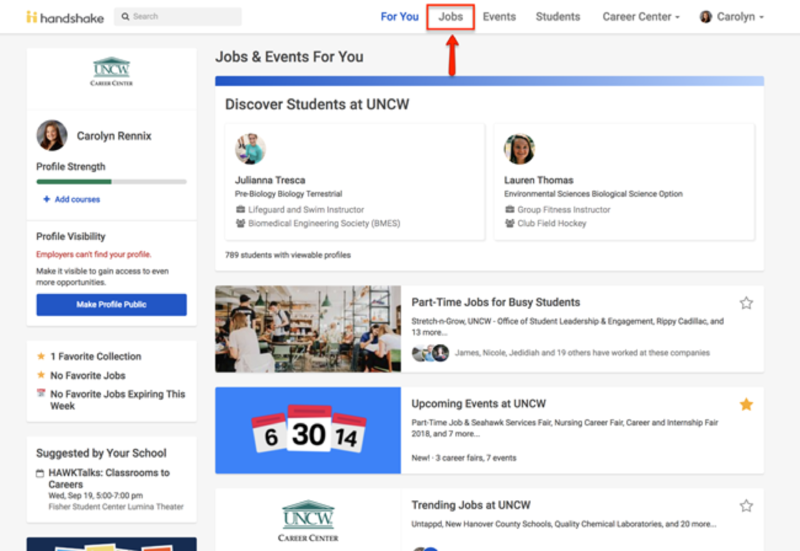 You can also select the industry, job functions, employer preferences, etc. DO NOT check the Work Study box – At this time, we are not able to use this filter. Again, the only way to specifically search for a Work Study job is to use the key words “Work Study” in the search bar. 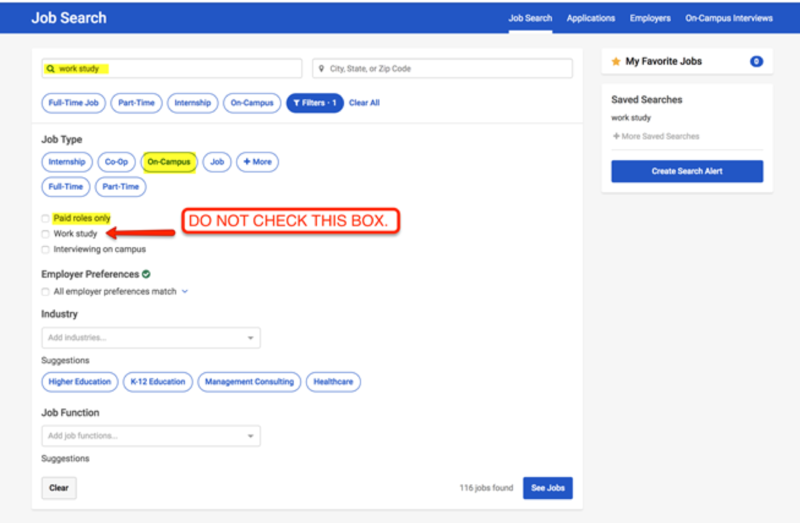 Once you have applied all of the preferred filters, click on the blue “See Jobs” button on the bottom of the screen. Click on the job title and it will bring you to the full job description as seen below. Click the green “Apply” button on the right of the screen. Fill in all necessary information and upload all required documents (resume, cover letter, etc.) and click the green“Submit Application” button. 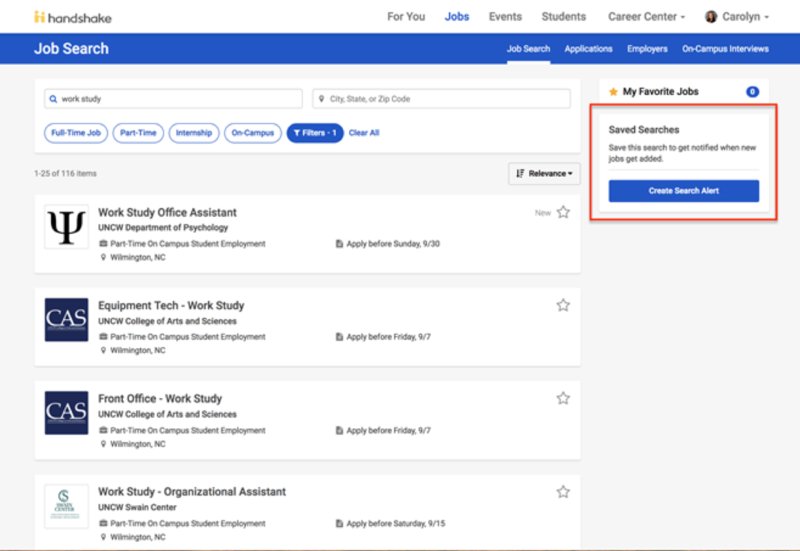 Save your “work study” job search so you can simply click on the saved search each time you would like to look through Work Study positions. You can do this by clicking the blue “Create Search Alert” button on the right of your screen. For step-by-step instructions, watch this video on how to save a job search. “Favorite” a Work Study position by clicking on the star symbol next to a job. By doing this, you will receive updates on the position, it will be added to your “My Favorite Jobs” box, and it will be featured on your home screen. Now you can begin exploring thousands of opportunities that are tailored to your interests! Contact the Financial Aid Office at 910.962.3177.